Do you ever wonder why you never have enough time — no matter how much planning you undertake to stay on top of things? That’s called the Planning Fallacy. We’re going to look at two solutions to this problem. But first, a glossary! Yarn Bomb: a type of graffiti or street art that employs colorful displays of knitted or crocheted yarn or fibre rather than paint or chalk. Putamen: A brain region that does lots, including using dopamine to contribute to learning and estimation. It’s also involved in the hate circuit, but we won’t get into that. There are no sensory receptors specifically dedicated for perceiving time. It is an almost uniquely intangible sensation. Of course, it’s not quite as simple as that — as you can see from the study’s diagram. But don’t despair – you don’t need to understand something to fix it! Onward to the solutions. Edinburgh protesters recently used yarn to protest excessive underestimation of time for the “Tramway to Hell”. For most tasks that involve multiple steps — from dressing, to checking email, to writing a business plan — we tend to underestimate their length. Frequently, we match our estimation to the too-small time available. However, if we actually take the perspective of what can be completed in a given amount of time, our estimations are much more conservative. This is according to a fantastic bank of recent research by Halkjelsvik and Jørgensen. For complex work, IT professionals and students studied by the Norwegian-based scientists were able to avoid underestimation by considering the amount of available time. For example, if you need to write that blog article you’ve been meaning to, you might decide that it should really take you about two hours. However, if you were premised with two hours, and asked if you could write the article in that time, you might say no way. The trick to more accurate planning is in considering the time available before the task itself. When we consider the time first, our mind will search for past references of what can be accomplished in that time frame, which leads us to trick number 2! This is the Nobel prize winning way, as discussed by Khaneman, Tversky and Flyvberjg as a solution to the “Tramway to Hell” and more. This one applies especially to tasks that are new. The idea is, simply, to find some similar task you completed in the past, that you remember the time to completion of, and use that as a reference point in estimating the new task. This sounds simple, but they’ve proven that it’s a powerful means to avoiding the planning fallacy. So how much time should you budget to sew that knit covering for your Chevy Nova? Before you decide “8 hours”, you should consider similar tasks in the past — that time you made a standing desk out of cardboard? Or maybe when you decided to build a Lego helmet for your accident prone puppy? Considering the length of similar tasks can help you to help your brain manage the tendency to cut time short. Maybe you’ll even have time leftover. 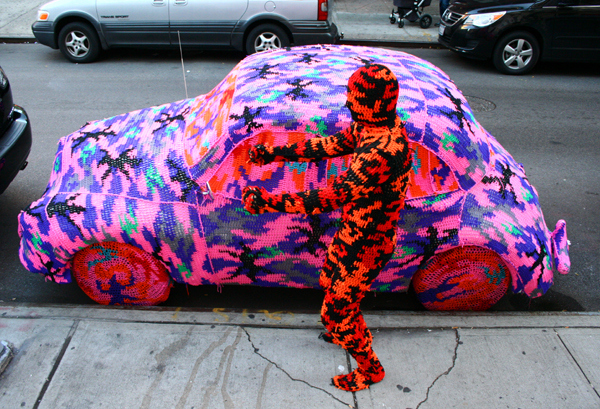 Don’t get yarn bombed — try these tricks and let us know what you think.